PWS 5-3. For a safe, reliable, supply of water. Precision Water Distillers, brings to you steam distillation. A pure process of water purification… to produce clean, healthy, drinking water in your own home or business. Automatic Fill automatic fill units connects onto the main water supply with a saddle valve, or connect to your kitchen sink with a faucet adaptor, so the machine fills itself, starts and stops, by its self, as you use water from the storage tank. The finished distilled water touches no plastic – so water is BPA free. ** Note: Free Shipping does not apply to this item, we will pay a portion of the shipping. This item is available for pickup in our Edmonton Store. 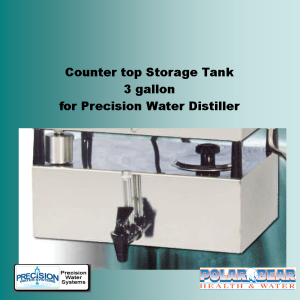 Precision Pure Model 5-3 Water Distiller. Automatic small family sized convenience. It has been designed for people living in apartments or condos, or where space and hookup restrictions are a consideration. Designed with the busy customer in mind, this distiller allows you to go about your day, with the secure feeling that when you need it, the purest steam distilled drinking water is available at your fingertips, without the extra work and inconvenience of handling bottles. Many outstanding features of this advanced design include: being constructed with high quality, easy to clean, mirror finish stainless steel. 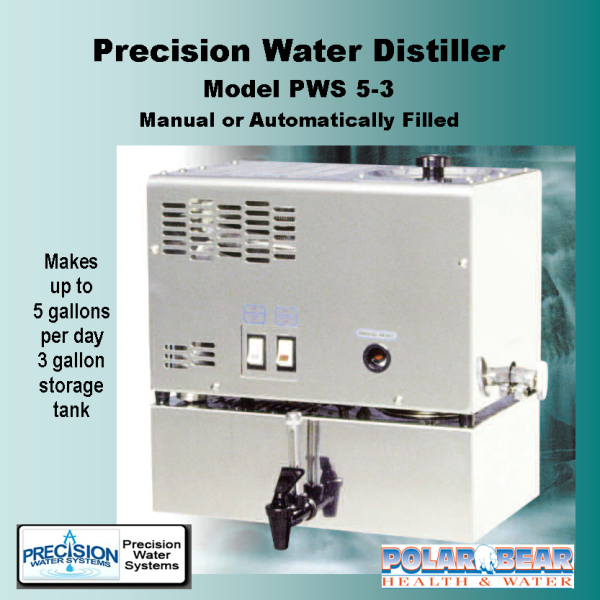 The Precision Pure Water Distiller Model 5-3 is a result of over 30 years of distillation manufacturing experience. Its features and benefits provide the very best water system for steam distilled drinking water requirements. It provides safe pure water at home for a fraction of the cost of bottled water. For more information on distillation or features of this product please fell free to contact us. 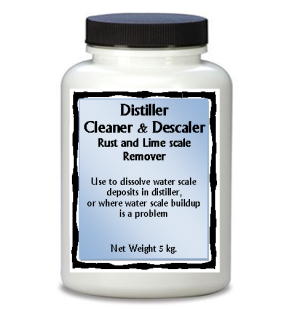 Mother Nature knows that distillation is the simplest and most reliable method of water purification! A Precision Water Distiller duplicates that method, to provide you with the most natural and purest drinking water to be used in your own home or business. 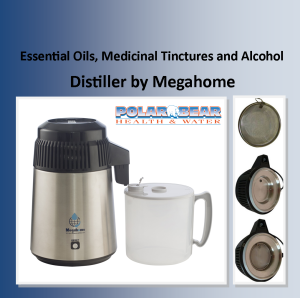 Obtain the true taste of foods, ice, drinks, juices, and coffee when made with distilled water. Independent laboratory testing shows that water distillers remove greater than 99% of all heavy metals, chlorine, fluoride, lead, pesticides, herbicides, organic compounds, bacteria, viruses and even radioactive water soluble compounds. 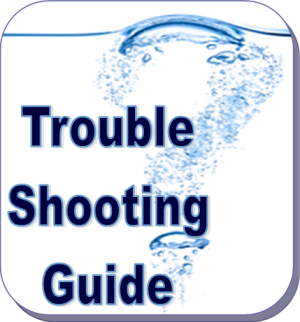 Boil water warnings, floods, oil spills, city water, country water, dugout water. With a distiller rest assured that your water is safe to drink. Many people feel blessed to live were we do, where drinking the tap water won’t kill us. But there is a lot in tap water we do not want to drink, like chlorine and fluoride. Xenoestrogens (toxic hormone-like substances that mimic the body’s own estrogens have been implicated in breast and prostate cancer, also residues from pharmaceuticals and recreational drugs. Because of this uncertainty, many of us try to avoid tap water. Then there are the problems of bottled water, and the uncertainty of where it comes from, how it is made or how fresh. If water is stored in plastic bottles or in store jugs, heat/sunlight leaches chemicals out of the plastic such as BPA. Do your planet good… plastic bottles and throw away/replaceable filters are just adding waste to our delicate planet. Dont waste water to make water. Distillation is the most natural way of purifying water—Mother Natures Way, with a Precision Water Distiller.